Video: Government uses loophole to dismantle rail line ← Save Our Rail NSW Inc. The fate of the Hunter rail line hangs on a legal technicality, reports the Maitland Mercury. In a twist that no one saw coming, Hunter Development Corporation, which answers to the state government, is attempting to forcibly acquire the Newcastle rail corridor – from the state government. Under the Transportation Act the government cannot rip up the rail infrastructure or dispose of the land without an Act of Parliament, which is where HDC comes in. Rail Corp started transferring ­ownership of overhead wiring and boom gates to HDC on December 19 and was expected to complete the process on Boxing Day. If this loophole proves successful in court this morning, the government will start dismantling the service, starting with the boom gates at Stewart Avenue, Newcastle, in the early hours of Boxing Day. 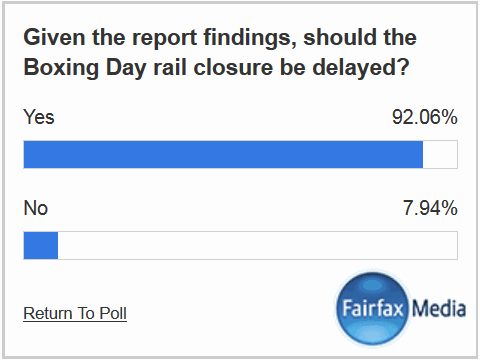 The government has told Fairfax Media it won’t touch the tracks straight away. Save Our Rail filed an injunction against the government earlier this week in an attempt to stop the truncation. The Queen’s Counsel represented Transport Minister Gladys Berejiklian and Rail Corp.
Tim Robertson SC, brother of high-profile human rights lawyer to Julian Assange, represented HDC. The court will consider today if there was collaboration between Rail Corp, HDC and the government to circumvent the act. If so, Justice Michael Adams is expected to apply an injunction on work to dismantle the tracks.